Be cool for your school! 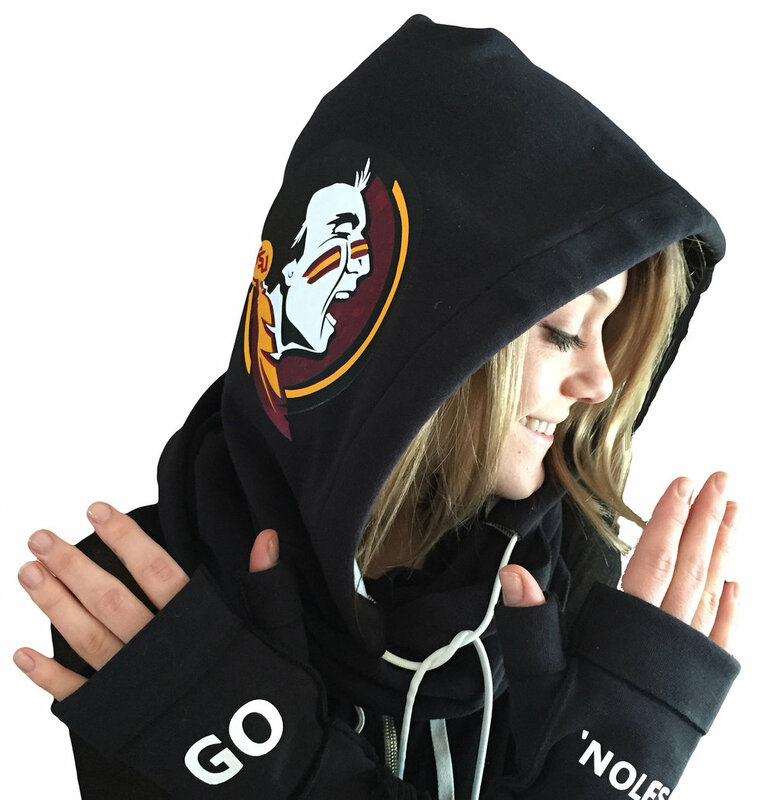 Our Team spirit HoodiSports collection can be customized in multiple colors and custom embroidery to make your statement! Laura Alison Design wouldn’t be what it is today without passion and love. When passion and love are the driving forces behind any given idea, suddenly anything seems possible. It is because of these emotions that we are able to provide you with the Hooded Infinity collection. A mother-daughter team, myself and my two daughters have been in business for about 7 years. Approaching Christmas of 2010, I decided that I wanted to give my girls something unique, something different that they couldn’t get for themselves, something they couldn’t find anywhere else. I’ve always considered myself a creative, and knew how to work yarn and knitting needles thanks to my now 95 year old mother. I started on my project and the Hooded Infinity design was born. As orders started coming in, it became apparent that what I had on my hands was no longer just a hobby, it was a business. With added encouragement from friends and family, I applied for and was awarded my patent for the design in 2013. As business grew and my daughters got older, we became a team and we wouldn’t have it any other way. Though trails and tribulations were bound to arise, through hard work, determination, and the utmost belief in our product we persevered. The design originated as a fashion product, which we had produced in a wool/silk blend for added comfort and sophisticated style. This piece is the perfect accessory to your fall/winter wardrobe. After gaining some weight during the winter holidays and going back to the gym, I had an AHA moment. I saw people lugging dirty towels to and from the gym, draping them over fitness equipment only to watch them struggle when they had to pick them back up, ultimately interrupting their workout. The entrepreneur in me knew there had to be a better way. I took the same design and produced it in a towel material and HoodiFit was born. Wick away sweat comfortably and conveniently while looking cool at the same time. From your morning run, to yoga class, to and from the gym, and even a day at the beach, you won’t know how you were ever without it. Two purposes. One Design. Endless possibilities. From left to right: Veronica and Maria - Sales and promotions, Laurie, Sarah, Melissa and Hope - our fabulous graphic and web designer. Please click on the link to the publication above or scroll down below to read full articles. Are you a retailer looking to carry our product line? Please fill out the form below with your business info and request a password to our wholesale login page. Have any questions or comments about our product line? We would love to hear from you! Questions about Licensing Opportunities for the Patented Hooded Infinity Scarf (Patent No. D693-096) or any of our other products? Are you a retailer who is interested in carrying our product line? Please fill out the form below or contact us via the email address or phone number below. We will respond promptly. Thank you.